In the first State of the Union address of his second term, President Barack Obama acknowledged the biggest driver of the nation's long-term debt is the rising cost of healthcare for an aging population, but proceeded to offer very few specifics on the type of Medicare reforms he's willing to make to sustain the decades-old federal program. Vowing to "reignite the true engine of economic growth—a rising, thriving middle class," the president said that task must start with making basic decisions about the nation's budget, which in turn will have a significant impact on the economy. He reiterated his earlier stance that broad-based economic growth needs a balanced approach to deficit reduction that includes both spending cuts and additional revenue. And he recognized that the $85 billion in automatic, across-the-board, federal spending cuts set to kick in on March 1—known as the sequester—are a "really bad idea." Even worse, the president said, is the proposal of some lawmakers to prevent defense cuts by making bigger dents in federal funding for education, job training, Medicare and Social Security. "On Medicare, I'm prepared to enact reforms that will achieve the same amount of healthcare savings by the beginning of the next decade as the reforms proposed by the Simpson-Bowles committee," the president said, referring to the late 2010 deficit-reduction proposal from the commission chaired by former Clinton administration chief of staff Erskine Bowles and former Sen. Alan Simpson (R-Wyo.). "Already, the Affordable Care Act is helping to slow the growth of healthcare costs. The reforms I'm proposing go even further," he continued. "We'll reduce taxpayer subsidies to prescription drug companies and ask more from the wealthiest seniors," he continued. "We'll bring down costs by changing the way our government pays for Medicare, because our medical bills shouldn't be based on the number of tests ordered or days spent in the hospital—they should be based on the quality of care our seniors receive. And I am open to additional reforms from both parties, so long as they don't violate the guarantee of a secure retirement." Although the president stressed a need for modest reforms to Medicare, he could have widened his view on this subject, said Julie Scott Allen, government relations director at the law firm Drinker, Biddle & Reath. "He repeated his promise against balancing the economy on the backs of seniors," Scott Allen said in an e-mail. "However, I think the dialogue must be broader than that. Protecting seniors' access to healthcare also means not instituting further devastating cuts to the healthcare providers we expect to provide those healthcare services from hospitals to clinical laboratories." Similar to last year, the president barely made mention of the Patient Protection and Affordable Care Act, even though the massive coverage expansions under the law will take effect late this year. "This was his signature achievement of his first term," Michael Tanner, a senior fellow with the libertarian think tank the Cato Institute, told Modern Healthcare. "You'd think he'd be bragging about it every chance he could. It's an amazing thing to be a signature achievement and then vanish." And when Obama did reference the 2010 law, Tanner added, the president prematurely gave credit to the statute for slowing the growth of healthcare costs. "It is true that costs have gone down in recent years," Tanner said, "But all the healthcare economists I know say that is because of the recession." Meanwhile, Tanner noted that the president offered "almost no specifics" on how to reform Medicare. For instance, Obama mentioned reducing taxpayer subsidies on prescription drugs, but didn't explain what he meant by that. Tanner speculated it could refer to a competitive bidding program in Medicare Part D, but the Congressional Budget Office "has looked at it in the past and has said that really won't save much money," Tanner said. The core of the president's address focused on a plan (PDF) that calls for making America a "magnet" for manufacturing jobs; providing Americans with the skills and training needed to perform those jobs; and making sure every citizen has an opportunity to make a decent living. To make his point that the best products require investment in the best ideas, the president cited a few examples in healthcare. 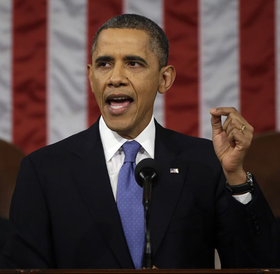 "Every dollar we invested to map the human genome returned $140 to our economy," Obama said. "Today, our scientists are mapping the human brain to unlock answers to Alzheimer's; developing drugs to regenerate damaged organs." Obama's address also focused on two issues that he has made top agenda items for his second term: immigration and gun control. On the latter issue, Rep. Tim Murphy (R-Pa.) chastised the president for failing to mention the need for improved mental healthcare services in America. "I am shocked the president referenced Newtown, yet did not once mention the words 'mental illness,'" Murphy, a child psychologist, said in a statement. "We simply cannot have any discussion on school safety without addressing the issue of untreated and undiagnosed mental illness. Awareness, identification, and proper treatment can turn lives around, but we need to have a better understanding of what the federal government is doing in this arena," he continued. "There are dozens of federal agencies responsible for direct care, public program grants, treatments, and research. Each federal program should be evaluated, and, as Chairman of Oversight and Investigations, I'll be leading a thorough review. With careful examination, we can address areas of failure and build on success." In providing the official response for the Republican Party, Sen. Marco Rubio (R-Fla.) cited the Affordable Care Act as an example of a federal program that hurts, rather than helps, the middle class that was the center of the president's speech. "Obamacare was supposed to help middle class Americans afford health insurance. But now, some people are losing the health insurance they were happy with," the Florida Republican said following the president's address. "And because Obamacare created expensive requirements for companies with more than 50 employees, now many of these businesses aren't hiring. Not only that, they're being forced to lay people off and switch from full-time employees to part-time workers." Rubio also emphasized the need for a balanced budget and said the biggest obstacles to achieving that are the federal programs in which spending is already "locked in." Medicare is one of those programs, Rubio continued, adding that the federal healthcare program helped his late father as he was dying from cancer and currently pays for his mother's care. "I would never support any changes to Medicare that would hurt seniors like my mother," Rubio said. "But anyone who is in favor of leaving Medicare exactly the way it is right now, is in favor of bankrupting it. Republicans have offered a detailed and credible plan that helps save Medicare without hurting today's retirees. Instead of playing politics with Medicare, when is the president going to offer his plan to save it? Tonight would have been a good time for him to do it."